Bhutan is magnificent mountains and verdant valleys. Bhutan is tales of Valiant kings and mighty heroes, legends of a miraculous saint riding flying tigress. Bhutan is trekking on serene mountains or being awe-struck by the intimidating centuries-old colossal fortresses. 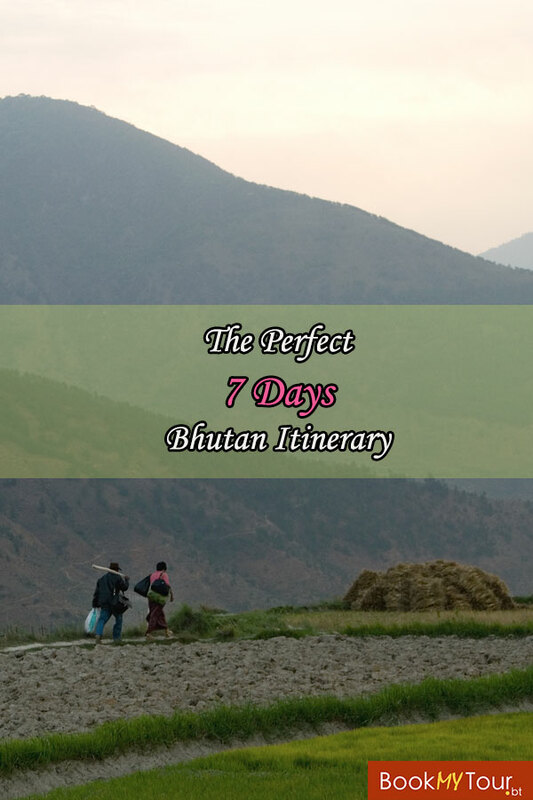 Delicious food and beautiful people, fascinating history, rich culture, and affluent nature, spending just 7 days in Bhutan would be an injustice to the adventurist in you but nonetheless if one week is all you have then it is better to stick to western and central regions of Bhutan. Though Bhutan offers all that you can absorb, traversing just the western and central parts will give you a taste of what Bhutan is made of and what exactly can Bhutan offer you in term of travel experience and memories. 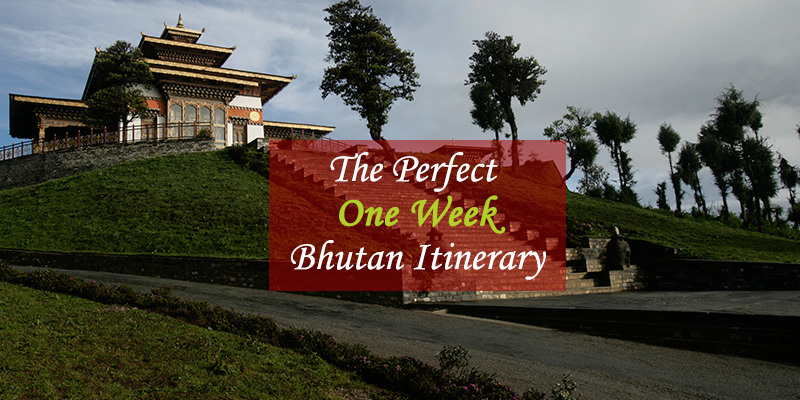 In this 7-day Bhutan itinerary, we show you how you can spend your time to be able to see the most popular places and attractions and also be able to get a taste of local Bhutanese life, and have that perfect week-long trip to Bhutan. Flying to Paro is the most common way to enter the country. It is almost like flying to any airport around the world but the landing is the most extraordinary experience. You will be graced by the mighty Himalayan range as the plane weaves through balls of clouds and the mountains begin to unfold its existence, through cracks of clouds, it is an unforgettable experience of a lifetime. You will also be able to see the tiger’s nest up-close as you land. After landing, as decided you will find our guide waiting for your arrival at the entrance to welcome you. After which you will be driven to Thimphu, the capital city. Paro is a small valley enclosed with mountains and the valley is adorned with Traditional houses. You will find yourself admiring the entire landscape of the valley. The houses are mostly located in the middle of paddy fields which add value to the scenery. You will pass the Paro town only to explore on the last day of your trip. A swift drive towards Thimphu is next on your list. At Thimphu, you will find yourself in a more modern setting compared to Paro with an extra number of tall concrete buildings. You cannot miss the fact that even the concrete buildings in Thimphu are ornamented with aspects of traditional architecture. Thimphu has developed at a very fast pace over the period of a few decades yet the capital is a true instance of rich cultural heritage. You will find Thimphu to be a place closer to home with a countless number of cafés which serve all types of coffee and hotels and restaurants that offer fine dining experiences. Some of the most popular cafés include ambient café, coffee culture, and the zone where you can relax and have a cup of good coffee. 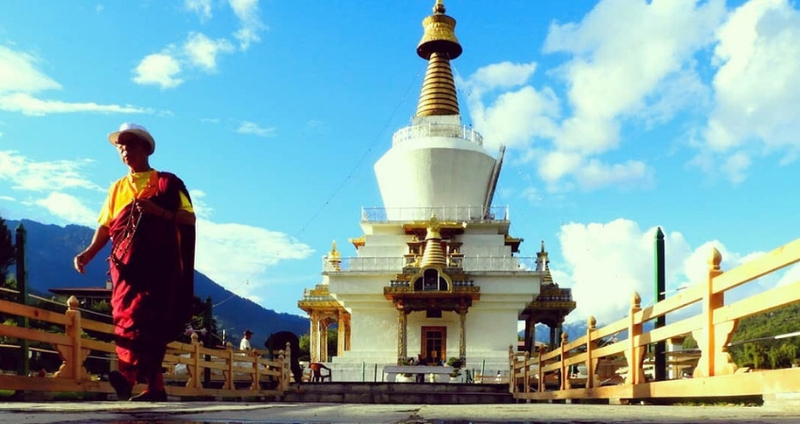 Thimphu offers a long list of attractions from a 17th-century fort (Tashichoedzong) to the world’s largest sitting Buddha to Takin zoos and sacred monasteries. You can visit it all. The second day is a road trip towards Punakha. Punakha is located at 2 hours drive from Thimphu. On the way to Punakha, you will pass a mountain-pass called Dochula pass at 3100 meters. The pass is very noticeable with its 108 mini temples spread across the pass. One can even see the mighty Himalayan range at a distance. The pass gets a little cold on cloudy days so it is better to take some warm clothes along just to stroll for a while on the pass. The Dochula café is a perfect place to get some hot beverage to fight the cold. After a short break, you will continue driving towards Punakha. Driving for another one hour will bring you to Punakha valley. As you enter the valley you will be welcomed by the calm rivers and daunting mountains that enclose the tiny valley. The valley still engages in agriculture and the entire valley is flooded with paddy fields. The houses are still very traditional but the most amazing Punakha Dzong, the palace of great bliss awaits your arrival. The valley flaunts its most prized possession, the palace on a confluence of two rivers. A traditional cantilever bridge will lead you to the palace. The palace is not only an architectural marvel but it plays a significant role in the history of Bhutan as most of the historic events that lead to the formation of present day-Bhutan were witnessed at this palace. After visiting the palace, you can choose to ramble around the villages for a while or even go to rest at your hotel. On the third day, you will yet again take a road trip further towards central Bhutan. An early drive from Punakha and a brief stop at the fertility temple. The fertility temple is located in a village just before you depart for your next destination. 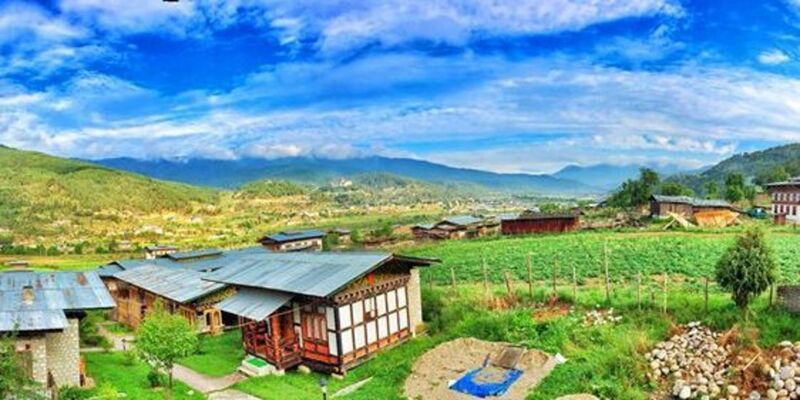 Phobjikha valley is located at a distance of 78 Km from Punakha and it takes 3 and half hours to reach there. The valley is also a part of a protected area for the endangered bird species called the black-necked cranes. These birds fly all the way from Tibet in winter and fly back in spring. The valley also boasts of the Gangtey Goempa. Gangtey Goempa is a temple that serves as a place of worship for the locals in the valley. The Valley even has nature trails that are meant for short hikes and strolls through nature. At Phobjikha, you can even have the opportunity to spend a night at a farmhouse. The farm-stay experience will be a refreshing one, as you will be treated as a home guest and not a tourist. The families are very warm and welcoming and will serve you with hot delicious local meals. During the night you can even ask the family to let you soak in a hot-stone bath which almost every household owns one in the region. A warm relaxing soak in mineral-infused water will rejuvenate you for the next day. The fourth day kicks off with a hearty breakfast from the farmhouse and seeing you off Bhutanese style. The next destination is Trongsa. The drive to Trongsa will take you through verdant woods of rhododendrons and tall oaks trees. On the way, you will pass Pele la mountain pass at 3,351 meters of elevation. You can make a brief stop at the Chendebji Chorten which is believed to be built at a point where the three ridges and the three edges of the sky meet. At Trongsa, you can visit the watchtower national museum. Ta Dzong Museum- the museum is set up in an old watch tower which exhibits historical artifacts and the watchtower was constructed in 1652 to watch out for invaders. Also, you will be halting at there for the night. After getting refreshments you can also take strolls through the town and villages. An early drive from Trongsa to Bumthang will take you three hours. Bumthang is located at a distance of 79 Km from Trongsa. 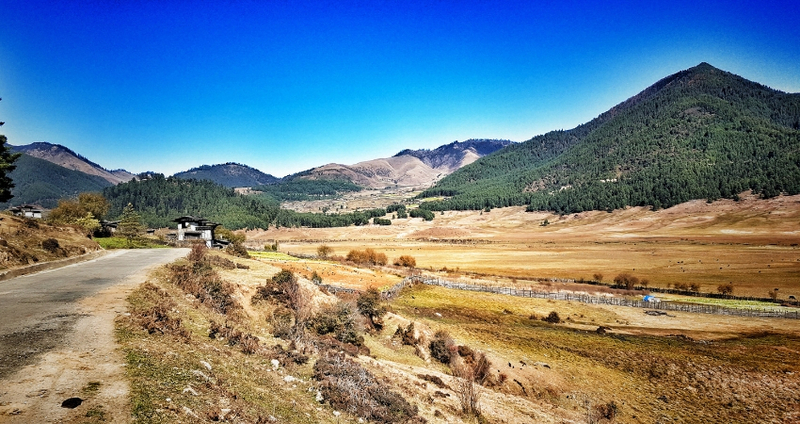 Upon entering the vicinity of Bumthang you will be taken aback by the wide valley. The valley is home to countless numbers sacred monasteries hence the valley is also revered as the religious hub of the nation. The valley is flooded with myths and legacies celebrating great Buddhist saints. You will enjoy visiting all the monasteries in the valley. To name a few monasteries like Tamzhing, Kurje Lhakhang, Jambay Lhakhang, the burning lake and many more all packed with historic significance and legacies from great saints and Buddhist masters. You will need to grab as much as possible as there is only so much you can see and do in just one day. Your second day in Bumthang will include more activities and sightseeings like rambling through the valleys or even climb uphill to visit the Jakar Dzong or fort. From here you can choose to fly to Paro (DrukAir operates domestic flights between Paro, Bumthang, Yonphula and Gelephu) or even drive back to Paro. On the last day, you will hike the much awaited Tiger’s nest. You will be dropped off at the base of the cliff, from where you will hike to the monastery for four straight hours, taking you through verdant landscapes and prayer flags guiding you all the way to the top. The arduous hike is the most rewarding once you reach the top and can enjoy the scenery and feel a sense of accomplishment. After completing the hike, you will want to sleep off the exhaustion but if you still up for some more fun; you can stroll around Paro Town and do some last moment souvenir shopping. The most accurate way to describe the town is that, two rows of two-storied traditional houses facing each other. Handicraft shops and cafés exist side by side throughout the line of shops. How to book your tour and how much does it cost for a week-long trip to Bhutan? You can book your trip with us. 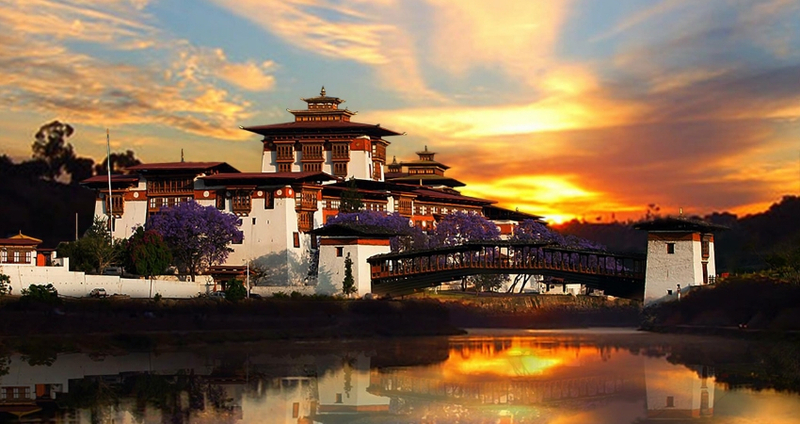 We are a registered tour operator and travel agent in Bhutan and have been organizing inbound tours for many travelers. Whether you are a solo traveler or traveling in a large group, we can arrange a tour for you, exactly the way you want it. Check out our tour package offerings to start off from.